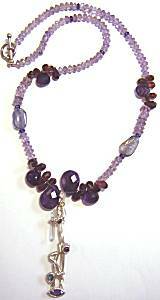 This page shows an exciting assortment of jewelry that incorporates AMETHYST, the February birthstone! Amethyst is a quartz stone that has purple color, may be translucent to crystal transparent, and colors range from lilac to plum-violet. Usually enhanced or heat-treated to preserve color. We have selections from a few of our artists, set in silver and gold. Designed by Rachel Rose of California, the lovely GREEN AMETHYST (27ctw) is joined to 18KT YELLOW GOLD in a wire-wrapped chain design. 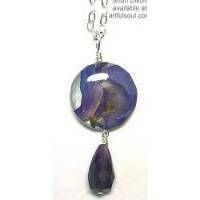 The larger intricately faceted pendant stone drops about 1 inch long on wire, a small BLUE SAPPHIRE accents above it. A pair of flat 18kt gold beads in satin finish around found amont the faceted 3.5mm amethyst beads. Spring ring clasp, can be attached along any link of the delicate chain up to 18 inches long. A slice from an AMETHYST STALACTITE reveals a rough beige inner stone core with prominent green band around it, edged with rough amethyst crystals in very pale lavender. This is paired with a GREEN QUARTZ below, giving the pale green a dominant appeal. Sterling silver prongs hold the amethyst in wire framework behind. Attached extra large bail. Pendant measures 2-5/8 x 1-1/4 inches overall. The cabochon of AMETHYST in cloudy and bright purple color has a bit of carving around outer edges, like a flame or leaf motif. Setting is open in back to capture a bit of light, smaller IOLITE cabochons set off to the sides in violet color. Band tapers to 1/4 inch in back. Set in pure silver covered by thick 18kt gold layer, design extends 7/8 inch lengthwise on finger. Size 7.25, not suitable for resizing. 20-1/2 inches long, 9 strands of glass seed beads have larger beads attached at regular intervals making for a busy look in rich color. Magnetic metal clasp. Seed beads in greens and purples with metallics, larger glass and gemstone chips include aventurine, amethyst and crystal. 1-3/4 inches long including sterling earwire, 1 inch across, polished pewter swings from soldered brass ring, patterns embossed on its surface, oval AMETHYST cabochon set at center. 1-3/8 inches long including nickel-free surgical earwire, 1/2 inch across. Matte black teardrop shape in background with shiny silver, silver filigree, and AMETHYST cabochon swinging above. 1-3/4 inches long including sterling earwire, 5/8 inch across. The lovely lavender and violet colors of larkspur are sealed on top of luminous white shell, an Amethyst briolette cut stone dangles below. Pendant is 1-1/2 inches long including bail ring, 5/8 inch across. The lovely lavender and violet colors of larkspur are sealed on top of luminous white shell, an Amethyst briolette cut stone dangles below. Suspended from 16 inch sterling chain. 1-3/4 inches long including nickel-free surgical earwire, 1 inch across. Silvertone circle with narrow/wide and domed shape has dimpled texture, oval Amethyst stone dangling in the center. 1-3/8 inches long including nickel-free surgical earwire, 1/2 inch across. Matte gray background oval frames the silvertone lacy oval, pale amethyst cabochon resting at its center.